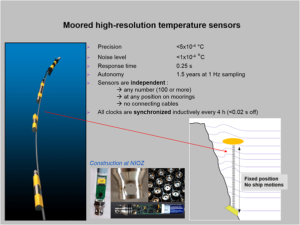 From the late 19nineties onward, temperature sensors were designed and developed at NIOZ that could measure at a rate of 1 Hz (100 times faster than the shortest buoyancy period and largest turbulence overturning Ozmidov scale while 100 times slower than the Kolmogorov scale, the smallest scale at which turbulent motions dissipate into heat), independently for one year, with a noise level better than 0.1 mK, a precision (‘relative accuracy’) better than 0.5 mK and a time response of about 0.25 s. The measurement principle of the sensor is by putting two NTC-resistors in a glass tube and connecting them to a Wien bridge oscillator, the same principle as used in standard oceanographic high-precision temperature sensors. All electronics housings are made of titanium with lead-throughs sealed with O-rings.
. By taping them to a nylon-coated steel mooring cable, at any custom-variable interval, their clocks are commonly synchronized every 4 h so that timing mismatch is smaller than 0.02 s. Since 2013, NIOZ4 sensors include the capability of measuring tilt and compass in all three axial directions. Since 2015 the standard 6,000 m depth-rated housings were upgraded to 12,000 m, for some sensors. The sensors are calibrated at NIOZ using a thermostatic bath with constant temperature levels to within ±0.1 mK of their preset values. The sensors drift by about 1 mK per month, after aging. The standard drift correction is by requiring a statically stable density (temperature) profile for a section of data of at least the inertial period, but preferably 2-7 days. 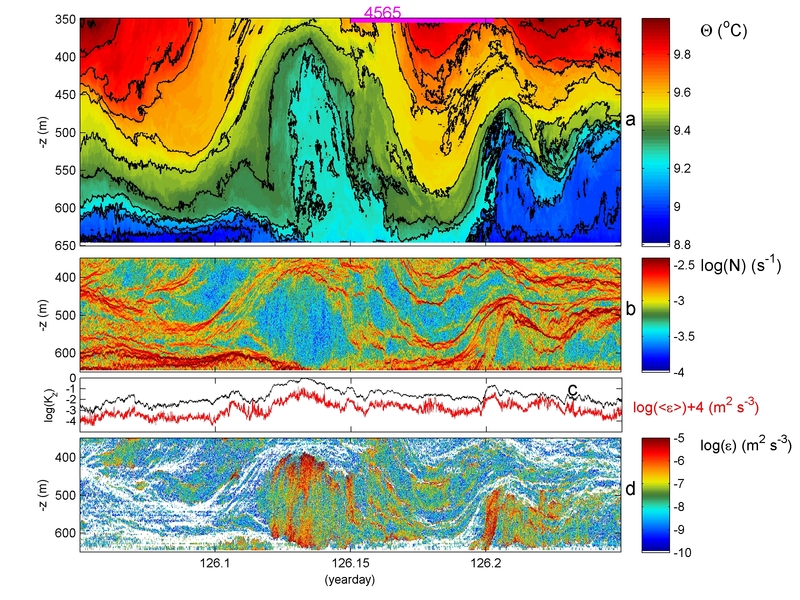 The ocean is stably stratified for such averaging periods. The calibrated and drift-corrected data are transferred to Conservative (~potential) Temperature (\Theta) values to incorporate pressure (slight compressibility) effects. 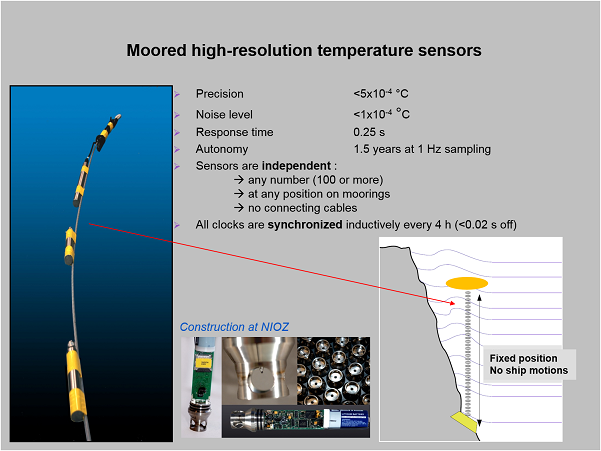 Shipborne conductivity-temperature-depth CTD-data are necessarily obtained near every single mooring to establish the local density-temperature relationship for use of the moored T-sensor data as tracer for potential density anomaly variations. When this relationship is reasonably tight, the sensor data can be used to estimate turbulence parameters through re-enacting the turbulent overturning. All the above necessary post-processing validate the instrumentation for academic research. The instrumentation is not suitable for monitoring absolute temperatures on prolonged time-scales. Under the above conditions, turbulence dissipation rate ε ~ d2N3 and vertical eddy diffusivity Kz ~ d2N are estimated from the T-sensor data using the method of reordering potentially unstable vertical density profiles in statically stable ones, as proposed by Steve Thorpe in 1977. Here, d denotes the displacements between unordered (measured) and reordered profiles. N denotes the buoyancy frequency computed from the reordered profiles.